The Jerusalem Bible, literarily speaking, is perhaps one of the best English translations available (and the fact that Tolkien worked on it adds bonus epic-awesome-points). Obtaining its text is worth any deficiencies a certain printing has, especially if said printing contains the Grail Psalter. And make no mistake, the Catholic Truth Society edition has many deficiencies. Rather than presenting the full document of Dei Verbum, this Bible contains only a resume which at certain points raises the reader's concern that biases of the editor are seeping through. Even though I tend to share the editor's views on a more limited inerrancy pertaining to Scripture, it is improper to force such an opinion on the common faithful or project it onto Vatican II documents, which are at best ambiguous concerning the subject. Matters degrade even faster when it comes to the historical commentaries and book introductions. Often, the editor (or commentator, or whatever you wish to call him) dates books by assuming their prophecies were always made after the fact. Especially annoying is his continual insistence that the historical basis of the Bible may be unreliable in the most basic sense. In the introduction to the books of Samuel he suggests Saul might have been an "important innovator" whose reputation was blackened by David. Later, he accuses the Chronicler of blatantly re-writing and misrepresenting history, offering little or no thought to justify his accusations or relate them to Christian tradition. Moreover, he seems rather tone death to the actual portrayal of Biblical characters in the text, suggesting substantial differences in perspective between authors where none exist (cf. 2 Kings 15:1-7 and note 26b on 2 Chronicles 26). Although the footnotes sometimes offer insight, this a rare occasion. Typically, the editor's hubris derails him at the exact moment he is about to enter into an interesting topic. Take, for example, note 2b of Luke 2. Rather than discussing the fascinating debate involving Luke's famous/infamous census passage, he simply asserts that Luke got his dates wrong and then almost jeeringly offers the possibility that Mary and Joseph always lived in Bethlehem as a solution to getting them to the City of David. He clearly rejects the historicity of much of Luke, a fact to which he alludes in the introduction by mentioning his belief that Luke changed certain details of the Jesus narrative specifically to cull favor with Rome (i.e. clearing Pilate and Herod of guilt, which for the life of me I can't see in the actual text). Now, if I stretch my mind and heart enough, I can imagine how one might possibly still adhere to Christianity and reject one of the two birth narratives of Christ (and to our editor's credit he seems to believe Matthew). But this is not a view one should impose on a Bible for the common faithful. The editor is just hotdogging and strutting his historical-critical chops, not providing the reader with any useful material to understand the text. He has not created a scholarly work here. For a good example of how historical critical methods should be used in Christian scholarship, see the NIV Archeological Study Bible. Not everything about this Bible is bad. The one column format is very attractive, the maps are useful, the text is clear and easy to read, the Divine Name has been removed (the use of YHWH is extremely offensive to the Jews and it's an ecumenical travesty we ever used it), the liturgical notes are expertly done, and the theological commentary is solid and very insightful. There is little business to distract from meditative reading. The book is a pleasure to peruse. I would recommend the CTS Bible to those who wish to obtain the text of the Jerusalem Bible or want a text that's in a format conducive to meditation. For people looking for a good study Bible, look elsewhere. For those seeking tools to share their faith, be forewarned that the missionary imperative of Dei Verbum has once again gone unheeded. The CTS Bible has almost nothing to offer people wanting to learn more about Christ and Catholicism. I cannot see it being useful in the field of evangelism or apologetics. If the Catholic Truth Society was trying to make a Bible for the everyday believer, they failed. But God bless them anyway, cause it sure looks pretty! If you would like to see some of my previous comments on the CTS Bible, go here. The CTS Bible footnotes and intros are written by Don Henry Wansbrough and are basically simplified versions of what is found in the NJB. I personally prefer the NJB because the notes and cross-references are so much more complete. I prefer the Jerusalem Bible (not the NJB any longer). I have had the well-known HUGE maroon hardcover in slip case edition since college, and recently bought an unused original boxed leather edition at a library fundraising sale. I compared notes between the JB and NJB and there is an unmistakable regression out of the Tradition in the NJB compared to the JB. I honestly do not think the 20 year span between the two editions could account for "scholarship" that reverses itself significantly in several instances. So I gave my leather NJB away and now refer to the JB (among other translations) when needed. Are these notes the original JB notes from 1966? I read somewhere that the notes of the CTS Bible are actually the notes from the third French edition of the JB from 1998. This review refers to an anonymous (and somewhat frightening) "editor," but in fact it was edited by Dom Henry Wansbrough, who is also on the Theology faculty at Oxford. Dom Wansbrough was also the chief editor of the New Jerusalem Bible. In fact, I think the NJB with notes is the superior version, but the CTS Bible has the advantage of matching the Bible used for the English lectionary. I take exception with some of Dom Wansbrough writings (his active involvement in Palestinian issues is not to my taste), I do not think it is fair to dismiss him as not being "scholarly." Furhter, the notes written by Dom Wansbrough carry full imprimatur so the implication in the notes in this Bible are "bad" seem unjustified. Geoffrey failed to note the CTS Bible comes in a variety of well-chosen styles and bindings. Neither can I agree with Geoffrey's assertion that the NIV Archeological Study Bible is an examplar of "how historical critical methods should be used in Christian scholarship." That edition, which has a reworked version of the NIV Study Bible notes, has numerous serious simple factual errors. Here are just three chosen arbitrarily: the edition spells a basic term such as "mikveh" three different ways, it prints an image of the Rosetta Stone upside down (when pointed out to the publishers, they changed the master to print it mirror image), and it gives incorrect references in its bibliography, misspell W. W. Hallo's name as "Hallow," and generally get things wrong. I played a game once where the other player chose a random page from this edition and I attempted to find a factual or reference error on the page -- and I was able to do so for almost all the pages chosen. While a reader seeking a historical-critical study Bible would be better advised to consult a Bible such as the HarperCollins Study Bible or New Oxford Annotated Bible, the CTS Bible is an excellent compact presentation that matches the lectionary in Britain. "The CTS Bible footnotes and intros are written by Don Henry Wansbrough and are basically simplified versions of what is found in the NJB. I personally prefer the NJB because the notes and cross-references are so much more complete." "The first of a series. The translation sometimes given, 'the census preceded that which was held when Quirinius was governor of Syria' is difficult to justify grammatically. The historical circumstances are little known. Most scholars put the census of Quirinius in AD 6, but the only authority for this is Josephus who is doubtfully reliable in this matter (see Ac 5:37n). The most probable explanation is that the census, which was made with a view to taxation, began in Palestine even before Herod's death, as early as 8-6 BC as part of a general census of the empire, and that Quirinius concluded it in AD 6, as Josephus says. This census, which in fact took place over a considerable period, was then known by the name of this important personality. Jesus was born certainly before Herod's death (4 BC), possibly in 8-6 BC. The “Christian Era”, established by Dionysius Exeguus (sixth century), is the result of a false calculation (see 3:1a)." As you can see, there is no correlation whatsoever between commentaries or book introductions. The notes of the NJB are far more faithful to a supernatural worldview, whereas the notes of the CTS lean close to Bultmann's philosophy in many ways, a philosophy which is completely incompatible with Christianity. I apologize for not knowing Dom Henry Wansbrough's name. But I'm sticking to my opinion of this particular work. Also, the Archeological Study Bible was offered as an example of the approach that should be taken. It has many errors in regards to things such as the Apocrypha, but that's beside the point. Misspellings and pictures printed backwards are trivial. What matters is substantive historical errors which, if corrected, would cripple an argument or interpretation being offered. I'm sure the Archeological Study Bible has some. However, I cite it merely as an example of the right approach. Now, concerning credentials, they mean nothing to me. In fact, that Wansbrough is on the theology faculty at Oxford automatically places him in suspicion in my mind. Each school has litmus tests for belief, and though faculty may differ significantly in particular details, their world views will have much overlap. It's just the way the world works. "Furhter, the notes written by Dom Wansbrough carry full imprimatur so the implication in the notes in this Bible are "bad" seem unjustified." Just a minor quibble. An imprimatur is an order to print the work. A Nihil Obstat asserts that a work is free of moral or religious error. However, in this day and age, both are equally meaningless. They are given as often as they are revoked and sometimes still printed in books from which they've been removed. All you need to do is find one bishop and one theologian who sympathize with you, and you can print almost anything. Sorry for the cynicism, but it's just how things are. Ironically, my faith in arguments based on authority has weakened significantly after a decade as a Catholic. Church politics is horrible, and in matters of Scripture scholarship, it touches the politics of academia as well. The mixture is a terror to behold. Thanks for helping me avoid this Bible. Also - I would just like to point out that just because something has an imprimatur that doesn't mean it can't be "bad". The imprimatur as far as I understand it, itsn't the Church's guarantee that something is error free, it is dependent on the man who grants it. That man is fallilble. But its better than nothing in some cases and perhaps worse than nothing in others nowadays. Matt, I wouldn't necessarily avoid this Bible unless you feel that erring commentary taints it. I can understand such sentiments since I hold them at times too, especially in regards to the NAB/NABRE. In my opinion, Bibles with little to no commentary are best. Then, you can purchase the notes separately and not have to worry about certain views being imposed upon you. I wish all publishers did it that way. It would help fight rampant consumerism and the urge to come up with another translation every other year or so, or whenever some guy thinks he has a new interpretation of the text that's worth hearing. Also, you need to read other reviews before forming your own opinion regarding the CTS Bible. I have tried my best to offer a thoughtful presentation of my own perspective. But it's just my perspective. For instance, I think the ESV is the best available English translation available. But not a single Catholic or Orthodox Christian worked on the committee that produced it, nor does it have any Church approval whatsoever. I'm sure many, and with good reason perhaps, would question my abilities of discernment. Bottom line is, I'm convinced my judgment is correct. You shouldn't be, at least not so quickly. If for nothing else, you need to read commentary that is at odds with Christianity, or borders on being at odds with it, in order to understand and equip yourself to be a better witness for Christ. When I started doing it myself, it was a very painful process. The tight, uneasy, squeezy feeling of doubt you get in your chest when your deepest beliefs are challenged is no small matter. On several occasions, I was nearly convinced by the critics and debated whether or not I should leave Christianity. But if you keep pressing and praying, the full picture, the full truth will come to you in time. You'll discover peace, and you'll know how to give a reason for your hope in Jesus, as St. Peter says, with gentleness. Your faith will be stronger if you take the time to shake it a bit. There's nothing 'wrong' or 'bad' with the CTS Bible itself, by that I mean the texts. It's a 'good' Bible for the everyday British Catholic, since it matches out lectionary exactly. It's got handy features such as the cycle of readings for the Mass and LOTH/Office of Readings. HOWEVER, I never use this bible for scholarly reading, merely my own devotional reading. Mainly because notes such as the introduction to 1 Peter just plain upset my sensibilities as a believing and practicing Catholic. Since this Bible is printed by the Catholic Truth Society, I'd like at least SOME credit to be given to St.Peter for authorship of those letters, if only from a traditional standpoint. But no, we are instead told that the letters do not seem to be written by an uneducated galilean fisherman. Wait, you mean the same one who speaks with such eloquence in Acts? Or who was told by the Lord that the Holy Spirit would speak for him in testing times? Don't we believe the Holy Spirit has a role to play in inspiring the authors of Sacred Scripture anymore? At least the RSC-2CE Study NT makes the suggestion that Peter dictated the letters to a secretary! But no, no room for any Catholic thought here, seemingly. It's a shame, since with sharper notes such as those found in the RSV-2CE Study New Testament, this would be a great apologetic tool for the modern Catholic, a product and publication more befitting CTS's supposed mission. Misspellings and pictures printed backwards are trivial. What matters is substantive historical errors which, if corrected, would cripple an argument or interpretation being offered. I disagree. There is great value in getting things right -- especially in a reference work, such a study Bible. A reference work which is unreliable and has numerous factual errors is not useful. For example, Hallo's Context of Scripture is the standard English collection of Ancient Near Eastern works. To misspell the author's name is akin to misspelling Shakespeare's name in a volume on English literature. Similarly, in a plaudit to a Rosetta stone, one expects that the author actually knows what the Rosetta stone looks like. Sure, a mistake is possible, but once pointed out, one would expect it would be corrected -- to make a second mistake is inexcusable. This is especially true since, of course, since one third of the Rosetta stone is in Greek -- to fail to orient it properly suggests that one is unable to read Greek. I would think that an ability to read Greek would be a basic requirement for an author of an "archeological Bible." I can assure that Dom Wansbrough understands (and even has taught) Greek. One can of course, disagree with his conclusions or theories, but attacks that characterize him as unscholarly seem partisan rather substantive. While heterodox commentary is an issue for me, the reason I will avoid this one is because I simply don't need another Bible with that style of commentary in it. I have the NJB, the NAB, two NOABs, etc. No probs. I understand. Just didn't know what angle you were coming from. Might I recommend St. Benedict Press's editions of the RSV-CE and Douay Rheims. "I can assure that Dom Wansbrough understands (and even has taught) Greek. One can of course, disagree with his conclusions or theories, but attacks that characterize him as unscholarly seem partisan rather substantive." I didn't attack him, just this one particular work. I trust your judgement as to whether this should be posted or not. I think there are a few types of logical fallacies here. 1. Geoffrey failed to note style and bindings (contextual implication: he can not be trusted to give the full report.) This is a logical fallacy called Ad Hominim (to the man). It is also one of several Red Herring fallacies, which is an attempt to divert the conversation to an irrelevant side issue in hopes of dominating the discussion. 2. The Arch. Study Bible is inconsistent in its transliteration of Hebrew words and a picture was printed incorrectly therefore its underlying scholarship is unsound. This is also a Red Herring fallacy, since this thread is about the scholarship of a different Bible. It is also a Cause and Effect fallacy which can be demonstrated like this: The editors of Bible A did a poor job. The scholars were not the editors. The poor editing proves that the scholarship was faulty. ~Uh, no it doesn't. 3. Dom Wansbrough understands Greek therefore his scholarship is sound. This is a fallacy of reason called The Appeal to Authority. It attempts to prove a point by appealing to an irrelevant, unproven or unconnected authority. BTW - thanks Geoffrey for a very helpful review. And I commend your conduct in the aftermath. Perhaps the discussion, at this point, can move into a different area or topic concerning the CTS Bible. According to the CTS website, the notes and book introductions are "new" and "were specially commissioned" for this project. This would seem to indicate that these notes and commentary are not simply condensed versions of the NJB. However, we could expect overlap or similarities between commentaries from the same author. I would have liked to also see the same gentler spirit that marks the NJB rather than the terse skepticism of the CTS samples. 1) Overall, the coverage of the notes and cross-references can be patchy. Romans and Galatians, for example, is well-covered compared to Proverbs. 2) The JB is a translation with grace and style. When it gets its translation right, it is brilliant. But too often it gets it horribly wrong. A lot of Henry Wansbrough's notes on NT passages are in fact correcting the transnational infelicities of the JB, and providing more literal translations. JB has this awful habit (as do most modern Catholic Bibles) of tenditiously amending the Masoretic text, even when there is no basis in the text itself or the ancient versions for doing this. 4) I wish the JB translation of the Psalms had been used, rather than the Grail Psalms. The Grail Psalms often have the feel of pedestrian poetry compared to the JB. 5) The skepticism and claims of many of the notes make me shake my head too. But there are many annotations on literary, historical and theological matters in the CTS Bible that genuinely aid one in understanding and applying the Bible. The CTS website is not completely accurate, many of the notes are "simplified" versions of the NJB ones. This is what the preface to the CTS Bible says. I am simply amazed that you attributed quotes to me that I never said . You are free to hold any opinions you wish, but I would ask that you not make up quotes (in italics to boot) that I never stated. You also failed it was the review which raised (the non-Catholic) Archaeological Study Bible as an exemplar -- a work that makes basic mistakes in Hebrew and Greek and is unreliable. Moreover, he seems rather tone death to the actual portrayal of Biblical characters in the text, suggesting substantial differences in perspective between authors where none exist (cf. 2 Kings 15:1-7 and note 26b on 2 Chronicles 26). 2 Chronicles 25:15-16: On returning from his defeat of the Edomites, Amaziah brought the gods of the son of Seir with him; he set these up as gods for himself, bowing down before them and burning incense to them. The Anger of the LORD blazed out against Amaziah. 2 Chronicles 26:4 He did what is pleasing to the LORD, just as his father Amaziah had done. Note: This judgment, taken from 2 K. 15, sits awkwardly with the Chronicler's re-writing of the story of Amaziah. This note sees entirely appropriate to me, and I fail to see how it is tone-deaf. In fact, even a casual reader will detect the enormous difference in the view of 2 Kings 15:1-7 and 2 Chronicles 25:15-16. If there is anything even slightly unorthodox about this note, I would like to hear an explanation. Take, for example, note 2b of Luke 2. Rather than discussing the fascinating debate involving Luke's famous/infamous census passage, he simply asserts that Luke got his dates wrong and then almost jeeringly offers the possibility that Mary and Joseph always lived in Bethlehem as a solution to getting them to the City of David. This comment does not accurately reflect the note. There is no jeering in the note. There is no assertion that Mary and Joseph "always lived in Bethlehem." Rather Wansbrough states that Matthew says they were "already [NB: not 'always'] inhabitants of Bethlehem." Here is the note: Quirinius was governor of Syria 6-9 AD. Lk. got his dates wrong. He uses the census to get Mary and Joseph to Bethlehem, the City of David, but such generalized movement for a census would create chaos, and simpler solutions are possible. Mt. suggests that Mary and Joseph were already inhabitants of Bethlehem. "...but such generalized movement for a census would create chaos, and simpler solutions are possible. Mt. suggests that Mary and Joseph were already inhabitants of Bethlehem." This does not sound jeering to you? To my ear it sounds neutral. By Wansbrough's analysis, there is an apparent minor conflict between Matthew and Luke (of course, the Gospels are full of minor disagreements). However, both accounts agree that they agree that the family was in Bethlehem for the census. The population of the Roman empire ("the world") at that time was approximately 45 million, so even if only 10% of the population were outside of their home towns, there would have been massive transportation chaos (that surely would have been independently noted.) Still, Wansbrough does not dismiss Luke's account but merely suggests that simpler solutions are possible. Wansbrough's account here is much milder than most commentaries. As an example of serious Catholic commentaries that a much harder view of Luke, see Joseph Fitzmeyer S.J. (Anchor Bible: Luke) or Raymond Brown, S.S. (The Birth of the Messiah). Of course, both were prominent members of the Pontifical Bible Commission, so their opinions lie within the acceptable range of orthodox beliefs. * the absence of variant readings. This edition of the Bible is intended to partner the use of the Bible in the liturgy, enabling public and private readers to prepare and follow up the liturgical readings. For this reason the translations used are those familiar from the books used in the Roman Catholic liturgy, the Jerusalem Bible and the Grail Psalter. The introductions and the explanatory notes are entirely fresh, written for this edition, though some use has been made of the notes to the New Jerusalem Bible. It is hoped that they will also prove a useful aid to private study of the Bible. Since the presumption has been that the text to be commented is that used in the liturgy, only in the rarest of cases has reference been made in the notes to alternative texts or manuscript readings. In other words, this Bible is a guide especially to studying the English liturgy (both the lectionary and the Divine Office) as currently used in Britain (and some other locations). Although Dom Wansbrough suggests using the volume for private Bible study, I think that there are much better single-volume Catholic choices, such as the full annotated NJB, the Oxford study edition of the NAB, or the (in progress) Ignatius Catholic Study Bible. I have often seen requests for an edition of the NAB that matches the lectionary text and the Liturgy of the Hours (including, presumably, the New Grail Psalter.) The Confraternity has declined to release such an edition, and I think that some of the criticism above indicates the problems that could arise if such an edition were released. Still, Wansbrough does not dismiss Luke's account but merely suggests that simpler solutions are possible. Solution? I don't understand why we even need to speculate on "solutions". It seems to me that uprooting 10% of the population, if that was the case, would be annoying but also a great boon for economic growth. It would increase trade in the empire a great deal. @Geoffrey: I reviewed all of those Bibles on my blog. I am well aquainted! Thanks though. Right now, my favorite "reading" Bible is a product of Wansbrough, its the NJB. Specifically, the NJB Saints Devotional Edition edited by Bert Ghezzi. I really enjoy the way it reads. The Pontifical Biblical Commission is not part of the Magisterium, nor does it have any teaching authority. The opinions of its members are completely irrelevant to what constitutes orthodoxy. Its role is advisory only. Several members have been the subject of inquiries before. You can read a brief history of the Commission here. As it is presently constituted, I hold little confidence in it. I do not (and would not) argue that Rev. Brown, Rev. Fitzmyer, or Dom Wansbrough are infallible. Rather I argue that they are within the bounds of orthodoxy. One proof of this is that their works have received imprimatur. I give further evidence below, by citing favorable remarks by Cardinal Ratzinger and Pope Benedict XVI. Ratzinger knew Brown and Fitzmyer well -- not only because Ratzinger was a professor, but because Ratzinger served at President of the Pontifical Biblical Commission for 25 years (1981-2005) -- overlapping with Fitzmyer and Brown's service on the Commission. Ratzinger personally presented Fitzmyer's book The Interpretation of the Bible in the Church to Pope John Paul II. a meeting place between the Magisterium and exegetes, a place of dialogue in which representatives of the Magisterium and qualified exegetes could meet to find together, so to speak, the intrinsic criteria which prevent freedom from self-destruction, thus elevating it to the level of true freedom. One of consistent themes of Ratzinger's life work has been integrating the scientific study of Scripture with historic faith. I argue that Wansbrough's work is that tradition. "In a detailed 1965 article in the journal Theological Studies examining whether Jesus was ever called "God" in the New Testament, Brown concluded that "Even the fourth Gospel never portrays Jesus as saying specifically that he is God" and "there is no reason to think that Jesus was called God in the earliest layers of New Testament tradition." He argued that, "Gradually, in the development of Christian thought God was understood to be a broader term. It was seen that God had revealed so much of Himself in Jesus that God had to be able to include both Father and Son." I find it hard to believe Ratzinger would look favorably upon such thought. Ratzinger's lecture offered criticism of some excesses in biblical scholarship, but he was personally complimentary of Brown and his scholarship in public interviews. He said, "I would be very happy if we had many exegetes like Father Brown." Quoted in Origins 17/35 (February 11, 1988) 595. I know that this is a little off topic, but I'm wondering if any of you are familiar with Farmer's: International Bible Commentary? I already have a variety of Catholic Bibles, so I don't really need a new one. Though I am looking to update the single volume Commentary I've been using [The 1968 Jerome Bible Commentary]. Any thoughts or recommendations would be appreciated. Ah, the 1968 Jerome Bible Commentary -- we've just been discussing two of its three editors: Raymond Brown and Joseph Fitzmyer. I own the International Bible Commentary -- it is an ecumenical Bible commentary with a strong Catholic focus. It is somewhat more conservative than the New Jerome Bible Commentary, which is perhaps its main competitor among Catholic Bible commentaries. The IBC seems fine, and I really appreciate its quite long introductions with fine surveys of the historical conditions. But for a variety of reasons, I don't find myself using the IBC that often though -- my personal opinion is that you can do better in single volume Bible commentaries. (My favorite single volume Bible Commentary remains the Eerdman's Commentary on the Bible, which is an ecumenical Bible commentary). I also have the 'International Bible Commentary.' I agree with Theophrastus' comments regarding the IBC. 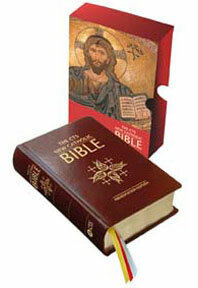 I use it, the Navarre Bible Commentary series and others for Bible Study and RCIA classes. Thank you for your comments. It gives me a little more to go on. An imprimatur was given to the 1991 NAB version of the Psalms, and then withdrawn by the Vatican. Sadly, it has become a somewhat meaningless credential.